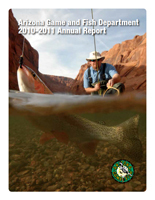 Each year, the Arizona Game and Fish Department publishes an annual report. These annual reports highlight the major accomplishments and significant events from the calendar year, as well as provide a financial statement for the past fiscal year (July 1 to June 30). In accordance with Arizona Revised Statutes, Section 41-4153, these annual reports are available in electronic form from this Web site or printed copies are available for interlibrary loan from the Arizona State Library, Archives and Public Records, 1700 W. Washington, Phoenix, AZ 85007 or call (602) 542-3701.